On 8th March, at the R2B event SYNERGI 2018 held in Amsterdam, 20 renowned players in different industrial fields, such as Toyota for automotive and Vallourec for energy, attended the ACCELERATE session on the CERIC’s services for the industry, to learn more about the different uses of some of the techniques available and the type of problems they can solve. 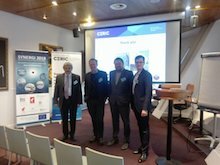 Speakers from some of the CERIC’s Partner Facilities presented a number of scientific and technological solutions for the industry. Dr. Tamas Belgya, from the Hungarian Academy of Sciences – Centre for Energy Research (CERIC Hungarian Representing Entity) explained to the audience the analytical results which can be obtained from the neutron beams at the Budapest Neutron Centre, and some of their industrial applications based on previous experiences with companies, as well as the type of challenges that can be addressed. 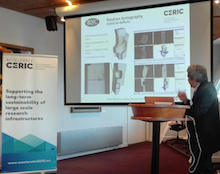 Dr. Mateusz Wojtaszek, from the National Synchrotron Radiation Centre SOLARIS (CERIC Polish Partner Facility), using examples of past cases, showcased the different functionalities of the beamlines at SOLARIS and the type of measurements that can be performed. Dr. Heinz Amenitsch, from the Institute of Inorganic Chemistry (CERIC Austrian Partner Facility) at the Graz University of Technology, presented the scattering analytical methods based on Small and Wide Angle X-Ray Scattering (SWAXS) and how they can be optimized for further investigations’ processes. Finally, Dr. Aden Hodzic from CERIC presented the use of multi-technique Nano-analytics in the pharmaceutical sector and their applications for drug research and quality control while avoiding potential drug side effects, a methodology which lead to a positive production process in a shorter time. A fruitful discussion followed the speakers’ presentations. The attending companies had the opportunity to collect answers to their strategic questions on their main research challenges. The programme and the abstracts of the sessions can be found here. At the SYNERGI Research to Business matchmaking organized by the Enterprise Europe Network, Angela Zennaro, CERIC Industrial Liaison and Technology Transfer Officer, had the chance to schedule fruitful meetings with Toyota, Renault and Sanvik, where needs and opportunities for collaborations were discussed.